I am neither a good cook nor a foodie. But, when my fellow bloggers Sunita and Shilpa started a new linkup to share food stories, memories, and recipes, I want to join the bandwagon too. Since I don't like cooking, I always try and search recipes which are quick and healthy. When we moved to the USA, I started liking Mexican food after Indian. There are very less good Indian restaurants at my place and so I try other cuisines. 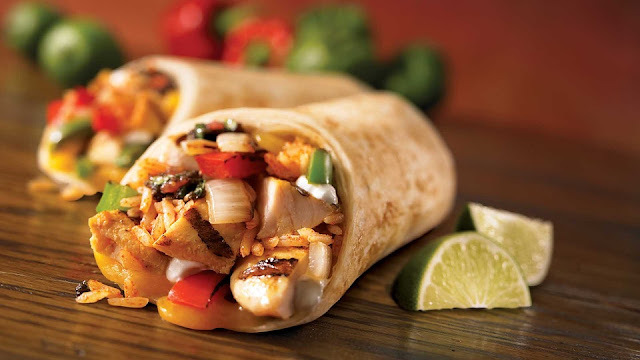 I liked the food in Chili's, Qdoba Mexican Grill and Chipotle. They are as filling as Indian food and tasty. 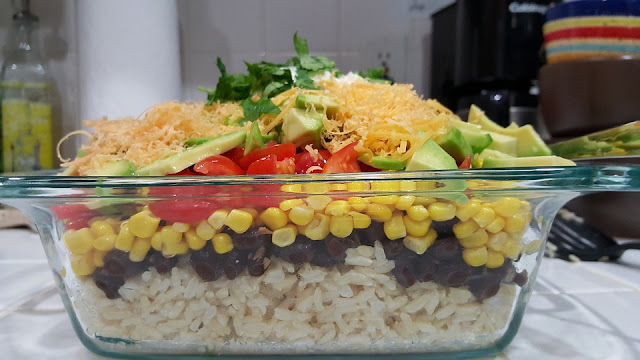 Here is one recipe that I tried at home which is a copy of Chipotle Mexican Rice bowl/ wrap. I can assure you that very less cooking is required. The recipe is in 4 steps. a) Chicken - Small Chicken breast pieces should be marinated with 1 spoon honey, 1 spoon olive oil, 1/2 spoon minced garlic, 1 green chili cut into small pieces, salt, and pepper and left for half an hour at least. They should be fried in olive oil with minced garlic and kept aside. b) Avocado paste - Make a paste of one avocado and mix with small onion pieces, tomato pieces, salt, and pepper. Lime juice can be added at the end. c) Beans - Add one spoon of olive oil, fry minced garlic (2 pods), one green chili cut into small pieces and 1 cup of cooked beans. Add salt, pepper, and oregano or any Italian seasoning you have. a) Tomato Salsa - Small tomato pieces, mixed with boiled corn, onions, salt, and pepper. b) Fry onions and bell pepper cut into thin slices in olive oil until they are slightly cooked and turn crispy. c) Add cucumbers cut into small pieces along with cherry tomatoes cut in half and some lettuce. Yogurt dressing: A small cup of Greek yogurt blended with ground cumin powder, salt, pepper and coriander leaves. This can be made quickly. But, you can try other dressings if you wish. After completing all the steps, Add all of them in a bowl/ place in a tortilla wrap after adding shredded cheese on top of it. Cilantro Lime rice + Beans +Avocao paste + Tomato Salsa + Fried onions, bell pepper + Yogurt dressing + Shredded cheese. Linking this to #FlavoursomeTuesdays hosted by Shilpa and Sunita. I love Mexican cuisine too. And this looks delish, Ramya, also relatively simple to make. I loved the way u explained the recipe, giving so many options. Looks yumm. This seems simple enough and quite exotic too! Will definitely try it and thanks so much for your contribution. Truly appreciate your joining in! Thanks. Options both for veg and non veg. Yes Shanaya. After Indian, mexican dishes taste great to me.